Look inside Bear Necessities Book A1. 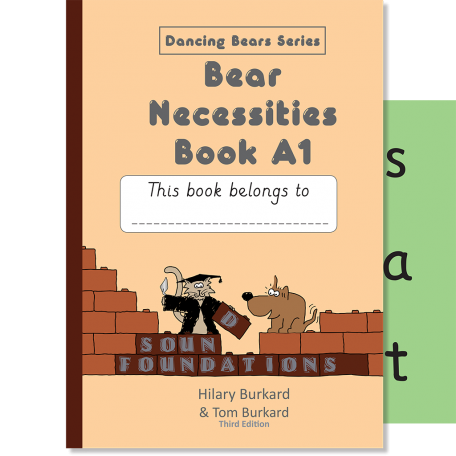 The books starts by teaching blending in small, easily-mastered steps, beginning with oral blending with simple picture cues. At the same time, the basic flashcards—which are used at the start and end of each session—teach children instantaneous recognition of single letter sounds and unambiguous digraphs (e.g., ee, ar, sh). The oral blending skills are gradually combined with letter recognition and transferred to print. The transition is gentle enough to ensure that the pupil rarely makes a mistake. Within a few weeks, children are beginning to read simple three-letter words. When basic blending skills are securely in place, high-frequency irregular words are gradually introduced in simple sentences with the additional reinforcement of tracing exercises. 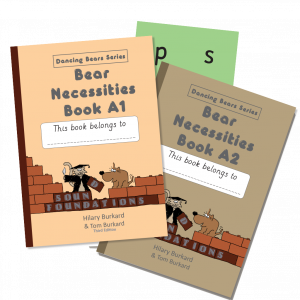 Our innovative ‘Bear Markets’, mini-scripts for two or three voices, are very popular with pupils eager to show off their newly-acquired reading skills! My daughter was diagnosed with Autism and Learning Difficulties and along with her older sister we had home educated her. She really struggled with reading and we tried all the major programmes, Jolly Phonics, Letterland etc. She knew all her letter sounds, but couldn’t ‘hear’ blends. We would sound out a blend and she would guess, not able to hear the sounds. By the time she was nine she could read the first three Jane and Peter ladybird books, but we quickly realised she was memorising the pages, if we took the same words and changed the font, she was no longer able to read them. In despair we spoke to her Psychologist who put us in touch with an Educational Psychologist, long story short, she was diagnosed with Auditory and Visual Processing Disorders. She can see and hear perfectly, but her brain doesn’t process it the same way. I researched as much as I could and in my trawls through the internet I found this site. By this time she was nearly ten and still no closer to be able to read. I ordered the Bear Necessities A1 without much hope of success. I was blown away. Within in weeks of starting it, using the flashcards, she was able to blend. Because of the cursor, it was also teaching her to read in the correct direction. She would read backwards so mug would become gum. The joining of the blends and the use of the cursor was the key. Because the pages are black and white with nothing to distract (we cover up pictures with paper) she finds it easier to cope with. The text started big and grew smaller slowly, also making it easier for her to adapt. Not only is she now able to sound words out, she can spell them. In the space of six months, she went from only spelling her name, to being able to write and read words like Dark, Shark, Park. She is not a fluent reader, but any means, which is why we are moving through the books in order. I have just ordered A2. But now, I can see a future for her where she will be able to independently read and it’s all thanks to this amazing reading system. I am so grateful I found this website and your wonderful books and I recommend them every chance I get. Thank you so much. 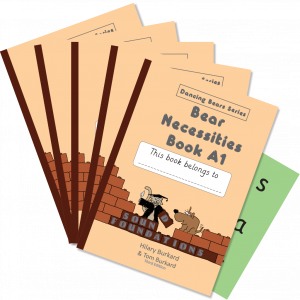 Five copies of Bear Necessities A1 for the price of four.